HOUSTON, TEXAS and CALGARY, ALBERTA--(Marketwired - Aug. 2, 2016) - Enbridge Energy Partners, L.P. (NYSE:EEP) ("EEP") and Enbridge Inc. (TSX:ENB) (NYSE:ENB) ("Enbridge" or the "Company"), announced today that EEP and Marathon Petroleum Corporation ("Marathon Petroleum") have formed a new joint venture, which in turn has entered into an agreement to acquire a 49 percent equity interest in the holding company that owns 75 percent of the Bakken Pipeline System ("Bakken Pipeline" or the "System") from an affiliate of Energy Transfer Partners, L.P. ("Energy Transfer") and Sunoco Logistics Partners L.P. ("Sunoco Logistics"). Under this arrangement, EEP and Marathon Petroleum would indirectly hold 75 percent and 25 percent, respectively, of the joint venture's 49 percent interest in the holding company of Bakken Pipeline. The purchase price of EEP's effective 27.6 percent interest in the System is US$1.5 billion. Closing of the transaction is subject to certain conditions, and is expected to occur in the third quarter of 2016. The System consists of the Dakota Access Pipeline ("DAPL") and the Energy Transfer Crude Oil Pipeline ("ETCO") projects. Phillips 66 owns the other 25 percent in each pipeline project. Both the DAPL and ETCO projects are highly contracted and secured by long-term take-or-pay contracts with creditworthy counterparties. "This acquisition is an attractive opportunity to participate in a pipeline system that will transport crude oil from the prolific Bakken formation in North Dakota to markets in eastern PADD II and the U.S. Gulf Coast ("USGC") providing another important link in our market access strategy that is driven by improving netbacks and access to the best markets for our customers. The pipelines offer competitive tolls, a significant level of long-term take-or-pay commitments from high credit quality customers, and strong risk-adjusted returns. Potential also exists for expansion of the pipelines should customer demand warrant. The investment is expected to be immediately accretive to distributable cash flow when the pipeline projects come into service, which we expect will occur by the end of 2016," said Mark Maki, President for EEP. Guy Jarvis, Executive Vice President - Liquids Pipelines and Major Projects of Enbridge, noted, "The Bakken Pipeline System is a great example of how the right acquisition can support and bolster our liquids pipelines strategy, while also supporting our U.S. sponsored vehicle -- EEP. 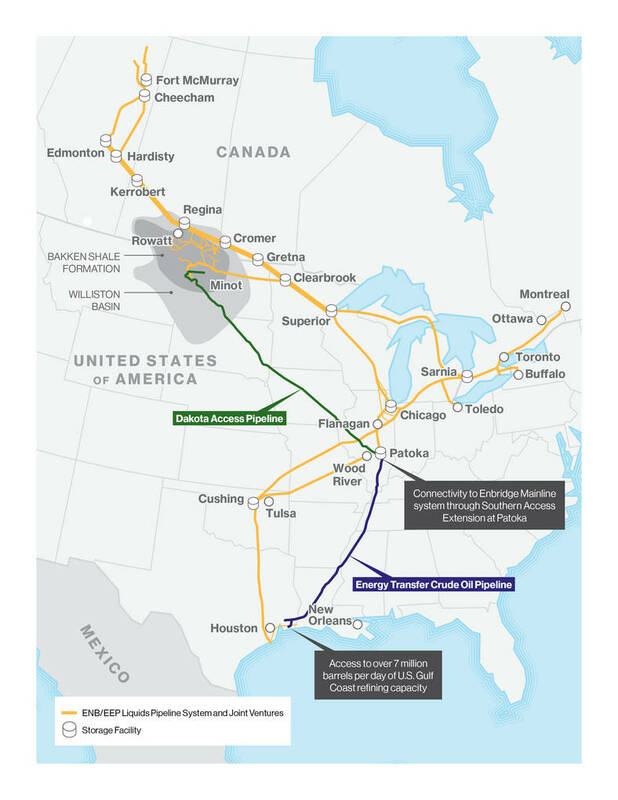 In addition to the obvious project benefits, Enbridge also looks forward to working with Bakken Pipeline to develop joint toll solutions that would provide an attractive opportunity to once again, cost effectively extend the reach of Enbridge's existing liquids pipelines system. Joint tolls will provide improved market access for customers, including a new path to the USGC via our mainline system through our recently completed Southern Access Extension into the Patoka Hub where it will be available for connection to ETCO. This will provide our shippers the ultimate potential to reach the eastern USGC, which has been a strategic priority for us." DAPL is a new 30-inch diameter pipeline from the Bakken/Three Forks production area in North Dakota to market centers in Patoka, Illinois. DAPL is expected to initially deliver in excess of 470,000 barrels per day ("bpd") of crude oil and has the potential to be expanded to 570,000 bpd. The pipeline has six origin locations in North Dakota and delivers to Patoka. The construction of terminals began in January 2016, mainline pipeline construction began in May 2016, and all major materials and equipment have been procured. ETCO, formerly one of the Trunkline pipelines, is a converted natural gas pipeline from Patoka to the Sunoco Terminal in Nederland, Texas. The pipeline consists of 62 miles of new 30-inch diameter pipe, 686 miles of converted 30-inch diameter pipe, and 40 miles of converted 24-inch diameter pipe. Construction of the new pipe began in April 2016. Both the pipe conversion and the pump stations are over 90 percent complete. Both DAPL and ETCO are expected to be ready for service by the end of 2016. EEP intends to enter into a bridge financing arrangement with Enbridge (U.S.) Inc., a wholly-owned subsidiary of the Company, to fund EEP's US$1.5 billion investment at closing. The Company is also taking steps to ensure that EEP has sufficient capital to permanently fund the investment in the System. To that end, it has proposed a longer-term, joint funding arrangement to EEP through which both the Company and EEP would fund the investment and participate in the returns generated by the System. As part of this arrangement, the Company has also indicated a willingness to provide funding to EEP to support EEP's ongoing investment. The terms of this arrangement are subject to the review of a committee of independent directors of the Board of Directors of the delegate of EEP's general partner, who will consider this arrangement in addition to other potential sources of long-term funding. While the terms of any joint funding arrangement with respect to the System are still in development, in prior joint funding arrangements, EEP has retained 25 to 33 percent interests in large greenfield development projects being undertaken by the Enbridge group with options to acquire additional interests. The Company believes that under a variety of possible longer-term funding scenarios, the acquisition of the System will generate attractive returns and near term cash flow accretion for both EEP and the Company. The Company plans to initially fund its investment in EEP from available liquidity which has been bolstered through the issuance of more than CDN$3.0 billion of equity and CDN$1.2 billion of debt securities across the Enbridge group of companies thus far in 2016. Upon successful closing of the transaction, EEP and Marathon Petroleum plan to terminate their transportation services and joint venture agreements for the Sandpiper Pipeline Project. EEP continues to believe the Bakken region is a highly productive and attractive basin, which has significant crude oil supply growth potential that will require additional pipeline capacity in the future. The scope and timing of the Sandpiper Pipeline Project will be evaluated during the quarter to ensure that it is positioned to meet the growing need for pipeline capacity while offering customers competitive tolls and strong netbacks. Additionally, in conjunction with a termination of the Sandpiper joint venture agreements with Marathon Petroleum, EEP will retain 100 percent ownership in our legacy North Dakota system, which is one of the most competitive outlets available to producers in the State. Enbridge Energy Partners, L.P. owns and operates a diversified portfolio of crude oil and, through its interests in Midcoast Energy Partners, L.P. ("Midcoast Partners") (NYSE:MEP), natural gas transportation systems in the United States. Its principal crude oil system is the largest pipeline transporter of growing oil production from western Canada and the North Dakota Bakken formation. The system's deliveries to refining centers and connected carriers in the United States account for approximately 23 percent of total U.S. oil imports. Midcoast Partners' natural gas gathering, treating, processing and transmission assets, which are principally located onshore in the active U.S. Mid-Continent and Gulf Coast areas, deliver approximately 2.0 billion cubic feet of natural gas daily. Certain information provided in this news release constitutes forward-looking statements. The words "anticipate", "expect", "project", "estimate", "forecast", "plan", "intend", "believe" and similar expressions are intended to identify such forward-looking statements. Forward-looking statements in this news release include, but are not limited to, statements with respect to: the Company's initial funding of its investment in EEP; the bridge financing arrangement between the Company and EEP; longer-term funding options, including proposed joint funding by the Company and EEP; expected closing date of the acquisition of the System; expected in-service dates; expected future returns and cashflow accretion from acquisition of the System; joint tolls and improved market access; and expansion capacity of the System. Although the Company believes these statements are based on information and assumptions which are current, reasonable and complete, these statements are necessarily subject to a variety of assumptions, risks and uncertainties pertaining to bridge financing and longer-term funding, including definitive terms thereof, closing of the acquisition of the System, project construction and completion, in-service dates, operating performance, regulatory parameters, economic and competitive conditions, supply of and demand for commodities and commodity prices. A further discussion of the risks and uncertainties facing the Company can be found in the Company's filings with Canadian and United States securities regulators. While the Company makes these forward-looking statements in good faith, should one or more of these risks or uncertainties materialize, or should underlying assumptions prove incorrect, actual results may vary significantly from those expected. Except as may be required by applicable securities laws, the Company assumes no obligation to publicly update or revise any forward-looking statements made herein or otherwise, whether as a result of new information, future events or otherwise. This news release includes forward-looking statements and projections, which are statements that do not relate strictly to historical or current facts. These statements frequently use the following words, variations thereon or comparable terminology: "anticipate," "believe," "consider," "continue," "could," "estimate," "expect," "explore," "evaluate," "forecast," "intend," "may," "opportunity," "plan," "position," "projection," "should," "strategy," "target," "will" and similar words. Although EEP believes that such forward-looking statements are reasonable based on currently available information, such statements involve risks, uncertainties and assumptions and are not guarantees of performance. Future actions, conditions or events and future results of operations may differ materially from those expressed in these forward-looking statements. Many of the factors that will determine these results are beyond EEP's ability to control or predict. Specific factors that could cause actual results to differ from those in the forward-looking statements include: (1) changes in the demand for or the supply of, forecast data for, and price trends related to crude oil, liquid petroleum, natural gas and NGLs, including the rate of development of the Alberta Oil Sands; (2) EEPs ability to successfully complete and finance the Bakken Pipeline transaction and other expansion projects or drop-down opportunities; (3) the effects of competition, in particular, by other pipeline systems; (4) shut-downs or cutbacks at EEP's facilities or refineries, petrochemical plants, utilities or other businesses for which EEP transports products or to whom EEP sells products; (5) hazards and operating risks that may not be covered fully by insurance, including those related to Line 6B and any additional fines and penalties assessed in connection with the crude oil release on that line; (6) costs in connection with complying with the settlement consent decree related to Line 6B and Line 6A, which is still subject to court approval, and/or the failure to receive court approval of, or material modifications to, such decree; (7) changes in or challenges to EEP's tariff rates; (8) changes in laws or regulations to which EEP is subject, including compliance with environmental and operational safety regulations that may increase costs of system integrity testing and maintenance; and (9) permitting at federal, state and local levels in regards to the construction of new assets. Except to the extent required by law, we assume no obligation to publicly update or revise any forward-looking statements, whether as a result of new information, future events or otherwise. Reference should also be made to EEP's filings with the U.S. Securities and Exchange Commission (the "SEC"), including its Annual Report on Form 10-K for the year ended December 31, 2015 and any subsequently filed Quarterly Report on Form 10-Q for additional factors that may affect results. These filings are available to the public over the Internet at the SEC's web site (www.sec.gov) and at EEP's web site.